Substance abuse kept Lisa from gaining traction for years. Training hard wasn’t possible in these conditions. That changed when she met a trainer who turned her into a competitor! I used to be a competitive runner and hockey player. I played every sport I could in and outside of school. I was very small and skinny, but I was very strong. In high school I probably weighed 100 pounds soaking wet. As I got older, I became skinny fat and hated the way I looked. I always was in awe of women who were muscular and was interested in bodybuilding. I started lifting in my late teens and got serious about it in my late 20s. Even though I was lifting heavy, my diet wasn't good, which held me back from gaining muscle. I struggled with alcoholism and drug addiction for many years, which destroyed my training for months on end. I was seriously unhealthy and spent many years spinning my wheels. I always thought one day I would compete in a bodybuilding competition. I didn't know when or how I would get there. I met many people who were long-time competitors and they helped dial me in. I had the strength and the training partners who taught me well, but I still had no clue how to diet. For many years, I had back injuries that kept me from training for long periods of time. I finally got sober on December, 17 2009, and began a whole new life and way of thinking. I was more focused. One day in the gym I was noticed by a trainer who was starting a new business that centered on contest prep. He told me he was getting ready to compete and said he would take me on as his first female client as long as I was serious. That started an amazing journey. We started by measuring my stats and body fat. 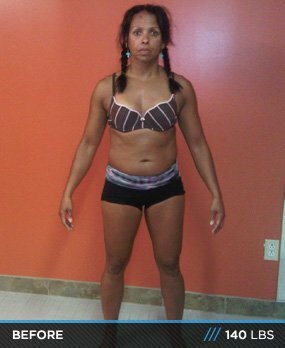 He created a diet and a training plan for me to add muscle and strip away body fat. I was focused on doing a show and everything was going great, but my back became a problem again. In September of 2010, I ruptured discs in my back, which led to back surgery (discectomy). Once again, my dreams of stepping onstage were gone. It took me six months to get back in the gym again. I lost every bit of size I put on and had to start over from scratch. I could barely do dumbbell presses with 20-pound weights. I went from being able to do three sets of 10 pull-ups to none. It was completely discouraging. Without being able to lift as heavy, I decided to switch to figure instead of bodybuilding. 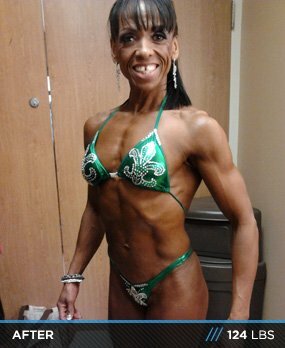 I got tips from a pro figure athlete and went back to my old coach for more diet and training plans so I could compete in June of 2012. Then I ended up relocating back to Canada. I found a great gym in the little town I moved to and found people who competed. I picked a show in London, Ontario on November 24, 2012, and got my diet dialed in. I stepped onstage and placed second in my class. When they announced my name for the first call out, I had the biggest lump in my throat because I knew the journey, the pain, and the agony was worth it. I finally completed something I started many years before. It's never too late. If you really want something, you will get it. There were two things that changed me the most. First and foremost was the diet, but it was mainly about learning new foods. I was very lucky to have someone create my diet and training regimens. Another huge challenge was working around my injuries. I have always had to deal with injuries and modify my training accordingly. I made it my goal to know my body better than a trainer. This is the one thing I can't stress enough. My future plans are to qualify for nationals and switch to physique. During the off-season, I will see how much size I can put on and decide which category to compete in for the upcoming 2013 season. I'm already taking training courses and my goal is to become a trainer and help people with contest prep. For anyone out there saying they can't, you need to change what I like to call "Stinking Thinking." It's amazing what our minds can and cannot allow us to accomplish. When I changed my way of thinking, my life changed. I battled through injuries, alcoholism, addictions, bad break-ups, huge relocations, and family disasters. It may have taken me a bit longer than I wanted it to, but I did it and that's what counts. I have seen some incredible transformations and the one thing everyone seems to have in common is we never gave up. It wasn't easy, but I'm on the side of the fence with a much sweeter view. Bodybuilding.com has always been a personal favorite of mine. The articles on lifting and dieting are great. I have been a long-time user of supplements and Bodybuilding.com is the main site I go to for ordering. There's nothing like reading the transformations for a little push in the right direction. Thank you, Bodybuilding.com, for giving me the opportunity to be featured as one of those transformations. Maybe I can be the little push that helps another person reach their goals.